In the last 12 months, our television, radios, and newspapers have blazed, beamed and borne story after story of natural disaster. The South Eastern Asia earthquake and tsunami, hurricane Katrina, hurricane Rita, and a massive earthquake in Pakistan and India (to name only four) literally moved land sea and air in what even the most affirmed atheist would describe as Biblical proportions. The results were no less striking in size - islands moved, mountains crumbled, cities flooded, governments floundered. Yet, nothing was more gripping and numbing than the mosaic of human suffering that followed as survivors fought for their very survival. The most basic of needs, when multiplied by the masses, became more than anyone could provide for. Good wishes, the logistics of delivery, and government itself were swamped by the reality of what it takes to sustain human life at even the most basic survival level. At the walk-in clinic I approached the reception area. With nobody ahead of me, the medical technician at the front desk listened immediately as I explained I was there to have my purple ankle looked at. (It had been injured 5 days earlier in a racing incident at the speedway.) After taking my name and my personal information, the lady looked at me and said, "As soon as I have a room, I will call you by name." 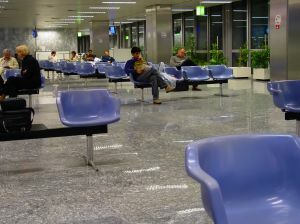 As I limped to sit alone in the waiting area, those words echoed in my mind with a reverberation of eternal dimension. "As soon as I have a room, I will call you by name." It's what all of us who are waiting for Jesus to come back have been told. He said to his disciples, "In my Father's house are many rooms; if it were not so, I would have told you. I am going there to prepare a place for you. And if I go and prepare a place for you, I will come back and take you to be with me that you also may be where I am." (John 14:2&3) This is the hope of all who have put their trust in Jesus alone. In the pain of this life and the sorrow of this world we are waiting for Jesus to come back for us. When our place is ready, He will come for us and (in the twinkling of an eye) finish making us ready for His place. I think it is safe to say that we have all seen geese migrating as the seasons change. Every year these water birds search out better climes as they flee the advance of winter's icy grip or summer's consuming heat. The method of travel is, of course, flight and the formation is a ?V?. The ?V? flying formation provides an aerodynamical advantage for the whole flock. Each goose flies a bit higher than the bird in front of it in order to enjoy reduced wind resistance. This makes their effort at air travel much easier - a kind of bird business class. Of course, for the goose at the front of the ?V?, there is no advantage. They face the sky head on and bear the burden and extra effort of leading. Fortunately for such leaders geese all take their turn leading their birds of a feather. I'm mentioning all this fowl stuff so you will understand when I say I'm dropping back in the ?V?. By the time you read this I will no longer be . . .
Springtime has returned to my backyard with full bloom. This seasonal reality is nowhere more evident than in the branches of a very large, decorative cherry tree in our backyard that boasts and displays full, rich blossoms. It must look like a giant, pink cotton ball to the Canadian geese flying north above our neighbourhood. In the morning, when I get out of bed and open the blinds on my bedroom window, its vibrancy of colour greets my sleepy, night-owl eyes. The sight of it fills my heart with appreciation, thanksgiving, joy, and melancholy. Yes, melancholy. In the midst of all that there is to revel in each day that tree is in full bloom, a silent thought reminds me that a morning is coming soon when my back lawn will be covered by a pink carpet of dropped-off, faded petals; marking again the steady and sure advance of the years. Together with the last present opened on Christmas morning, the last day of summer vacation, and the last kiss goodbye at an airport, the falling and passing of the last celebrated blossom of spring sounds another reverb in the cavernous echo of human existence. Thankfully there is an antidote for this subtle . . .